My gift to you will contain 5 parts. And each part will represent a solid result of a 25-years hard work with my six strings. Every part will contain a tip to learn, a tip that will help you build a strong blueprint for your long-term education methodology and create a personal discipline of a practice routine. This guide will help you also to achieve a serious advantage as a guitar beginner who just started learning to play. Regardless all those critics coming from people who don’t play, you should NEVER, I repeat, NEVER let your passion be defeated by someone else’s point of view. If your mom or dad doesn’t accept your hobby seriously enough, then you can just put some efforts to explain to them what it means to you. It’s not an easy part, I know, but it’s vital to be understood by your family on first place. If you play non-stop, forget about dinner time, homework or other duties, this means that you are obsessed with what you are doing, and regardless what your parents say, this is a real blessing! There are parents who notice their kids’ talents, of course, this mission is possible. But sometimes it takes weeks, months, years and even a whole life to be understood and accepted. And that’s because, if you are obsessed, if you are doing guitar playing all day long, and even sometimes night, this means that you are loving what you do: That’s priceless! Not every person has this power. And nobody has the right to cut your wings, not even your own parents, friends, brothers or sisters, spouse, kids, or whoever they might be or mean to you. Keep on doing what you love and try to keep all criticism apart. Be stubborn. Sometimes it takes too much effort. So, be aware of not losing too much in explanations of why you dream of being somebody. Just be. If you are feeling impatient to play this or that lick faster, stop it wherever you are! It is a huge mistake. And you don’t need this happen to you. Trust me, I’ve been there. There is nothing more frustrating than repeating everything from the beginning. Here’s the big secret: if you want to be a virtuoso, play slowly! Play slowly until your fingers’ strength falls apart, until you can’t even strum a chord anymore. Because after this comes the result. There was a kung-fu education in old times, when trainees were hitting the water with their hands during one year before their muscles realise how crucial is to slow down the movements and master every little detail in the path of the hand. So better not losing time going back to where you started from. And this story is real..
Only a few people in this world could live away from the society. We are born to socialize. And that’s why we – humans – need to meet people and share experiences with each other. Same as guitar players. We are people who play guitar and we need to meet other people to build bands, relationships, fanbase and even families. You simply need to learn and experience while sharing what you can and know. To solve problems, to gain recognition, to charge you batteries. Let’s say you just started to learn a complicated solo and there’s a difficult part which you cannot perform good enough… You try so hard many zillions of times, but you’re not even in the same zip code as Correct. I can assure you that there is a 100% possibility that you would find somebody who knows this solo and explain the tricky parts while you are looking for such a person, and there’ s a close to 0% probability to find help if you don’t. So, take a look around. Find your support for what you are doing and give, take, share. This is it. The veriest part of a musician the music itself. And this is the reason you should consume it as much as you can. Music builds music. The veriest act of creating music is listening to it. Listening to music builds an immense universe of culture in your brain which could be used on a subconscious level at the moment of creating music and performing it on your guitar. You will always compare what you play to what you’ve been listening to. Because that’s the beauty of music: it is all connected. All the time. Tip #5: Be that stubborn black sheep. Be unique! Among being around people and sharing with them, it’s always a good idea to start thinking of building your own style from the very beginning of your guitar education. It happens to me often to just wanting to escape from what the crowd is doing and record the strangest and never-expected solo in spite of all. Several months ago I was asked to record a guitar with a solo for a hard rock band. I did it and what I actually liked the most and spent the most of the time for, was the solo. It was far beyond the hard rock patterns. It was like a fairy tale to me. I loved it. The band didn’t. They loved the rhythm parts, which were average. So they took the rhythm only. Ok, great! So I took this solo away and created a completely new track which new rhythm. It was too inspiring for me. So I had my new song and a whole new horizon of creativity. What’s the story? If you love your “weird spark”, let it be a constellation. You never gonna tap it out, there are endless capabilities. Once you achieve a given level, there is always a room to grow. When you start to be passionate about playing the guitar, it becomes your best friend. Sometimes guitar players are getting addicted to their guitars. And this is a wonderful feeling. This is how it gives you a purpose in life. You have an idea, you work on it, and it becomes a reality, which creates the feeling that you matter. being a guitar player or a singer/songwriter with a guitar. There is no business like showbusiness, someone said. It’s a challenging and a very exciting profession. When you are looking for the guys for your band you could really meet extraordinary people who can change your life completely. You build relationships which teach you huge things on how to communicate as an artist or just as a human being. and practice routines which is awesome in the way that reflects on how you reach success in anything else you could possibly do. Whether carrying it in school or in your neighborhood, the guitar is one of the coolest things that can be carried in hand. It definitely attracts attention and makes people remember you in a fancy way. You can just play chords on the beach or go camping in the forest with friends. 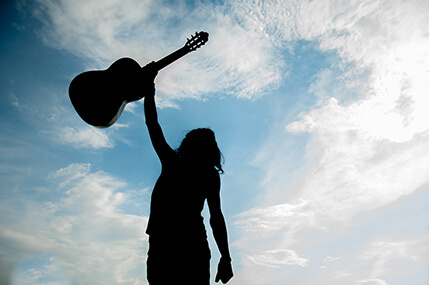 Go and create a lot of memorable experiences while playing on the guitar, and everybody singing famous and cozy songs. and design any personality within yourself depending on the style you choose to play. Just jump into the music genre that you like more than any other. This is a very strong power you need to deal with if you become a passionate guitar player. People are happy when you give them nice experiences with music. And they will always listen to you if you have something exciting to tell them with your guitar. If you become a professional guitar player (which needs dedication and hard work) you can do many things with your career. Just need to choose the right fit and the right form and start digging. Amazing things need a certain amount of hard work, but the reward might be bigger than you could even imagine. You can be a stage performing artist or a studio recording musician or any other thing that happens on your path of growth. It is always a surprising opportunity lifestyle. And you will love it! 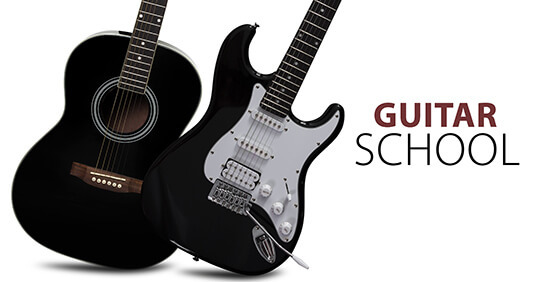 By learning guitar you will develop your listening abilities to reach a higher level. Any musical instrument gives you this opportunity. The guitar, being a string instrument, goes very close to the natural human vibration of sound waves inside the body (and it all starts from the very commonly known String theory!). This fact makes it one of the most desired instruments to play. By children or adults. By everybody. In many cases, strong talents are met inside introvert persons. If you find yourself hiding from the crowd, but you still need to communicate with the others and feel part of the society, try guitar lessons. You will be surprised how everything will change for you, and many doors will become widely open.